Farmhouse Kitchen Design tend to focus on natural materials, unpretentious design, and cooking spaces that can accommodate large meals. Guests should always feel welcome and comfortable in these spaces, even if their boots are still dirty. Cabinets, chairs and tables are often constructed from quality hardwood, with cherry, maple, oak and pine particularly common choices. Pine is an especially popular choice for farmhouse-style kitchens—its knotty, natural appearance can make it a perfect fit for the down-home appeal of a farmhouse kitchen. For seating and dining options in farmhouse kitchens, high-quality woods are often the first choice. Tables are often classic “farm tables”—long planks of oak or other high-quality woods fitted closed and sturdily together. Table and chair legs and back supports may feature rich detailing, and chair backs may even incorporate carvings featuring pastoral or farmhouse scenes. The use of certain fabrics and patterns for curtains, tablecloths and placemats in farmhouse kitchens is quite common. Plaid, gingham and toile are quite common choices, with the latter often featuring pastoral or historical scenes from farming eras gone by. Accessories like cookware, containers and other storage options similarly tend to reflect a countrified, down-home theme. Straightforward flatware designs may feature rustic wooden handles. Mason and other traditional canning jars may be used for storage, reflecting the historical traditions from which farmhouse kitchen design grew. 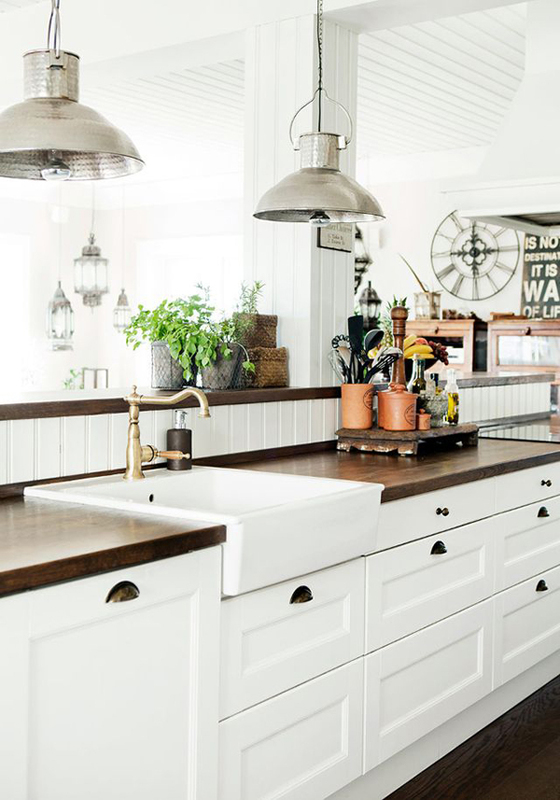 Finally, ancillary design touches like artwork or antique farm equipment may be used to add visual interest to a farmhouse kitchen design, artfully hung from walls or integrated into the design next to more contemporary cooking implements.